Welcome to "Geology for Today" website! This site was designed specifically for Washburn University geology students to supplement their classroom and text course materials, providing support for course lectures, exam reviews, and laboratory exercises. This website may also provide introductory knowledge to persons with an interest in geology. At the "More" tab, you can learn about fossils and ancient life, deep space, extreme weather, meteorites and tektites, plate tectonics, restless oceans, minerals, volcanoes, dinosaurs, rock textures, geology of Kansas, and much more. Geology is the study of science that deals with the Earth's physical structure and substance, its history, and the processes that act upon it. It includes the organisms that have inhabited the Earth and how they have changed over time. Geology is a multidisciplinary field that incorporates aspects of biology, chemistry, meteorology, astronomy, physics, archaeology, and other related scientific fields. Geology can be a very interesting and rewarding career. Geologists work to understand the history of our planet, therefore, the better they can foresee how events and processes of the past might influence the future. As far as scientists know, our planet Earth is unique in the entire universe. Certainly this is true of our very own solar system. Nothing we have observed leads us to believe that there is another planet just like Earth. Here's a video that shows just how unique our planet Earth really is. Enjoy! Dr. Tambra L. Eifert. Home to the sciences at Washburn University, Stoffer Science Hall opened in 1960 and was named in 1961. Since then, many students have been exposed to a broad framework of scientific understanding and have acquired learning skills in a logical, systematic manner. 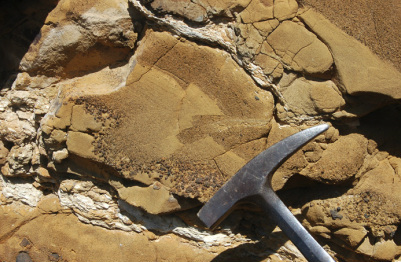 Geology courses taught at Washburn University serve as a valuable addition to the sciences because they encompass a combination of field and laboratory studies which enhance the students' understanding of the physical, chemical, and biological processes that have shaped our planet over time. At Washburn University we strive to meet the needs of the students and faculty, as well as the community at large by serving as a uniquely rich resource of rocks, minerals, and fossils. Displayed on the first floor of Stoffer Science Hall are a treasure of various rocks, minerals, and fossils that have been unearthed throughout the world. These displays serve as a teaching lab for our geology classes and a learning experience for the general public. Many of the displayed specimens have been donated to and provided by the Department of Physics and Astronomy, while others have been displayed by local residents and geology faculty.